Get started with these 5 skin care essentials. Vitamin C, magnesium ascorbyl phosphate, support skin`s vitality by targeting sun damaged, dull, dry and over-exposed surface cells for a lighter, tighter, brighter appearance. Use AM & PM. Apply to damp skin, gently massage and rinse clean. Use daily. Apply to clean face and neck. 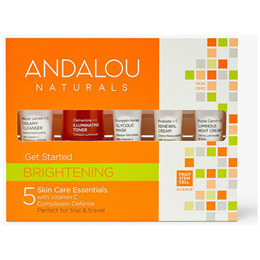 Below are reviews of Andalou Get Started Brightening Kit by bodykind customers. If you have tried this product we'd love to hear what you think so please leave a review.